Fan criticism following Thomas Tuchel's departure as Borussia Dortmund boss prompted the club's chief executive to issue a statement questioning the manager's "reliability and loyalty". Tuchel left after two years in charge on Tuesday, three days after winning the German Cup. "It is not the result alone that matters," chief executive Hans-Joachim Watzke wrote in an open letter to fans. "What also matters are fundamental values such as trust and respect." The letter added: "It is about teamwork, communication, authenticity and identification. The ability to communicate and work as a team, reliability and loyalty. "The fact that Dortmund and Tuchel are parting company has provoked criticism and a lack of understanding from some sections of our fan base. We, the people responsible for the board of management, can understand this. "With Thomas Tuchel at the helm, Dortmund enjoyed two successful years in which our sporting objectives were achieved. "However, we - sporting director Michael Zorc and myself - also did not always see eye to eye with the coaching staff during this period. "Unfortunately, we no longer believed the current coaching arrangement offered us a foundation for a successful future collaboration based on trust. "Following intensive talks we ultimately decided the best measure would be not to extend the co-operation with the coaching staff beyond the end of the 2016/17 season. This joint decision is unanimously supported by all committees within the club." 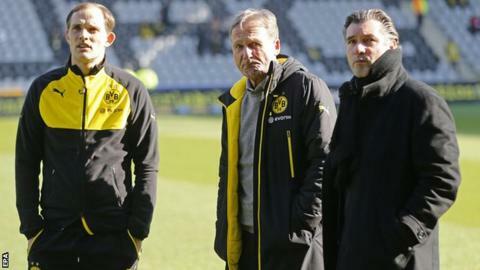 Relations between Tuchel and Watzke had been strained since Dortmund's team bus was damaged by an explosion on 11 April. Tuchel had claimed neither he nor his players were consulted about whether they should play their Champions League quarter-final home tie against Monaco less than 24 hours later. Watzke denied that was the case and said the claim had annoyed him. The match went ahead and Dortmund were beaten 3-2. On an official Twitter account created on Tuesday, Tuchel wrote: "I am grateful for two exciting, beautiful and eventful years. It's a pity to not go on. "Thank you to the fans, the team, the staff and to all who have supported us." Dortmund finished third in the Bundesliga to qualify for next year's Champions League having reached the quarter-finals of this season's competition.